Video and audio of Jerame Reid's fatal Dec. 30, 2014, encounter with police in Bridgeton, N.J., was released by the Bridgeton Police Department. It shows the 36-year-old's last minutes alive before officers shot him, NJ.com reports. 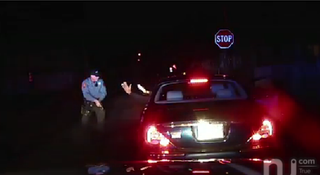 In the video, police can be seen pulling over a blue Jaguar being driven by Leroy Tutt, 46. Reid was with Tutt on the passenger side during the routine stop. Officer Braheme Days can be heard in the video explaining that he pulled Tutt over because he ran a stop sign. Days asks Tutt for his driver's license. Seconds later the exchange turns sour, with Days pulling his gun and screaming at the two men in the car to show their hands. "Show me your hands, show me your f—king hands!" Days can be heard shouting repeatedly, along with, "Don't you f—king move!" His partner, Roger Worley, can be seen entering the frame of the dashboard camera on the driver's side, also appearing to have drawn his gun. "Get 'em out the car, Rog. We've got a gun in his glove compartment," Days tells his partner. As the officers attempt to get the car doors open, Days can be heard again saying, "I'm telling you, I'm telling you! Keep your f—king hands right there, Jerame. … You reach for something, you're going to be f—king dead." Seconds later the same officer can be heard shouting, "He's reaching! He's reaching!" A few seconds later the passenger car door opens, and it appears that Reid attempts to get out. His hands appear to be in front of him. Days quickly retreats before both he and Worley fire their weapons and Reid falls to the ground. According to NJ.com, the Cumberland County prosecutor's office is investigating the officers' use of deadly force. An autopsy has been conducted, but the results have not been made public. The office has noted that "during the course of the stop a handgun was revealed and later recovered." The Bridgeton Police Department only released the video after an Open Public Records request was made. "The Bridgeton Police Department as a law enforcement agency does not, as a routine, consider the posting of any such video as compassionate or professional," Bridgeton Police Capt. Michael Gaimari said in a news release Tuesday, NJ.com reports. "In absence of the OPRA [Open Public Records Act] request this video would not be released to the public out of respect for the family of Jerame Reid, basic human dignity and to protect the constitutional rights of all those involved." Both Worley, who is white, and Days, who is black, were placed on paid administrative leave after the shooting.